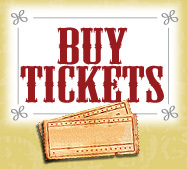 > Learn more about one of Florida's most popular attractions! 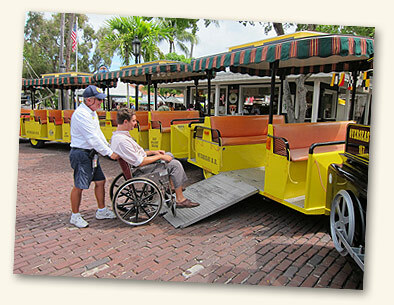 Some of our Conch Tour Trains are equipped with wheelchair ramps. To manage these devices often takes two people to maneuver them into position and requires a considerable amount of space. It is for these reasons our ramps can only be deployed in our designated stops. However, where possible we are happy to accommodate. Collapsible wheelchairs are always permitted on any of our Trains and all of our CASTmembers are willing and able to assist with the loading. We are happy to provide this service and ask for your assistance to allow us to safely serve you with minimal impact on other guests utilizing our services. We request that you give us a minimum of 24 hour notice of your arrival date, the time you would like to take the tour, and at which Conch Tour Train stop you will board the tour. You may call our office at 305-294-5161 to provide this information. This will assure that a properly equipped vehicle may be made available. Please arrive at the designated location no later than 15 minutes prior to your departure time so that we can accomplish the boarding process smoothly and safely. We look forward to having you on The World Famous Conch Tour Train. Copyright © Historic Tours of America, Inc.
to race, color, creed, or national origin in accordance with Title 49 CFR 374.103.